My Flight Blog: Is Flying Safe? According to a recent study 2002 set a record low for the number of accidents in General Aviation aircraft. One of the questions I hear often when I tell people I am learning to fly is: Is it safe? They cannot believe that with minimal amounts of training flight instructors willingly hand over the controls to their students. I am not sure they realize the instructor has matching controls and is always there to assist. Until I came across the 2003 Nall Report, I did not have any statistical information to share in regard to the safety of flying General Aviation aircraft. 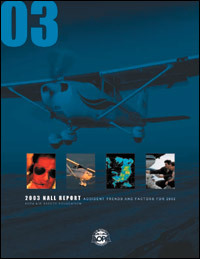 The Nall Report is released each year and is considered to be the most complete review of General Aviation safety and General Aviation trends. You can download the report from the Aircraft Owners & Operators Website (www.aopa.org). I found this fact particularly interesting: "The vast majority of General Aviation accidents in 2002 (79 percent) were fatality-free, a statistic that has held true every year since modern aviation safety record keeping started in 1938. This contrasts strongly with the popular public misconception that a light aircraft crash is nearly always an automatic death sentence." Unfortunately, the majority of General Aviation accidents are related to pilot error (72.6 percent). According to Bruce Landsbert, AOPA's Air Safety Foundation Executive Director, "Accidents that simply should not happen - those due to fuel mismanagement and flights into bad weather, mostly under VFR (Visual Flight Rules) - continue." These accidents are avoidable with proper preperation and training. While having my safety hat on, I also found it interesting to see how the aircraft I am training in fared safety-wise in the last year. The Cessna 152 had 22 accidents in the past year. Sadly, one of those was fatal, five involved serious injury, four had minor injuries and twelve had no injuries. You can review the Air Safety Foundation Accident Database on the Aircraft Owners & Pilot Association (AOPA) website. I am off to continue studying and making sure I am best prepared to safely manage the pilot-in-command responsibilities. Thanks for posting this - it gives me a better comfort level when my daughter starts flying! Linda, Thanks for checking out the site. Tell your daughter to check out www.beapilot.com. They offer introductory flights at most flight schools for just $49.